If you read our earlier post on the Pros & Cons of Cast Iron Pans, you’ll know how important seasoning is for a cast iron pan. While “seasoning” might sound hard and scary, it’s really not as finicky as many make it out to be. What is cast iron “seasoning”? Seasoning is the act of adding oil to a cast iron pan, with the goal of it being as close to “non-stick” as one can get. The oil helps to fill tiny surface imperfections on the pan, because the truth is that even though your pan might look smooth, it’s covered with miniscule little bumps and ridges. This is what food can stick to. Unfortunately the seasoning process is not quite as simple as rubbing some oil onto the surface and calling it a day. Nope, there’s a cool chemical process called polymerization that’s key to a good seasoning. Hold up: Poly-meriz-whattt? Polymerization occurs when oils are heated to a point where the fat molecules react, and bond together to create longer chains, which in turn bond to the cast iron. What is left behind is a baked-in oil coating that actually resembles plastic more than fat. Sounds weird, but this process is required to achieve the holy-grail “non-stick seasoning” we all want in our cast iron pans. What if the pan I bought is pre-seasoned? Long story short, even if you bought a “pre-seasoned” pan, we still recommend investing time to build up a better layer of seasoning. Factory seasonings are a good start, but they’re by no means perfect. If you want to be able to cook things like eggs on your pan without sticking, you’ll need to put in a bit of work. Trust us: it’s so worth it. We like to think of seasoning a cast iron pan in two parts. The first is your big initial seasoning. This is what you’ll do when you bring your cast iron pan home for the first time. It takes a bit of effort and time, but it’s not something you need to repeat often. This is what we’ll talk about today. Then, once you’ve built up a good layer of base seasoning, the rest is simply quick, ongoing maintenance. Note: if you already have a cast iron pan, but haven’t been the best at taking care of it, you can always follow the steps for the initial seasoning. A neglected pan can come back to life with a good seasoning, so even if your pan isn’t new, this can make a world of difference! So you’ve got yourself a cast iron pan - now what? Well, first things first: you should season it. There are five steps involved with seasoning a cast iron pan: clean, dry, oil, heat, repeat. Step 1 - Clean the pan: Use hot, soapy water to scrub and clean the pan. If there are any stubborn stuck-on bits, you can rub salt into the pan with a cloth or scrub brush to provide a bit more oomf. Rinse thoroughly. Step 2 - Dry the pan: Once you’ve rinsed the pan, flip it over to shake off excess water in the sink. Then, put the pan on the stove and heat it up until all the water is evaporated. Drying the pan over the stove is a more thorough way to ensure all the water is gone, since a towel will always leave a bit of moisture behind. So, even if you want to towel dry first, always follow-up with the stove. Step 3 - Oil the pan: Drizzle oil into the pan and use a paper towel to rub the oil in thoroughly. You’re aiming to get a thin layer of oil rubbed into every nook and cranny. Don’t forget the handle and bottom of the pan, they need love too! When it comes to the type of oil: Unsaturated fats are preferred (think: neutral vegetable oils), since unsaturated fats are more reactive than saturated fats, and therefore are faster to polymerize. Also, almost everyone tends to have them on hand. Some sources tout pure flaxseed oil as being the best option for seasoning cast iron pans, but to be honest, we don’t bother because flaxseed oil is quite expensive - and we don’t think it’s necessary. You can get great results with other mainstream oils like grapeseed (our favorite) or canola. Step 4 - Heat the pan: Preheat your oven to 475-500°F (or as high as it will go). Place a piece of tinfoil on the bottom rack, to catch any oil drips. This will make it cleaning easier. Then, place your oiled pan in the oven, face down, and bake for 1 hour. Putting your pan face down will allow any excess oil to drip off your pan and on to the tinfoil sheet below. Pro tip: Open as many windows as you can and also turn your kitchen fan to help air your place out. After the hour is up, let the pan cool in the oven. The surface should look darker than when you first started. Step 5 - Repeat: Continue this process 2-3 times, until the surface is almost pitch black. It’s important that you always use a thin layer of oil for each coat. If you go too thick, you risk it coming out sticky (a clue the oil didn’t properly polymerize). Again, flipping the pan upside down will help extra oil drip off as well. After you’ve repeated the process enough times, consider your pan “seasoned”. Now, you’ll just need to maintain your pan with regular use. As you continue to use your pan with everyday cooking, you’ll help it build up it’s seasoning further. After following these steps, you can now consider your pan “seasoned”! Once your pan has been through its initial seasoning, the best advice is to use the pan regularly. With proper care and maintenance, your cast iron pan will only get better with time. 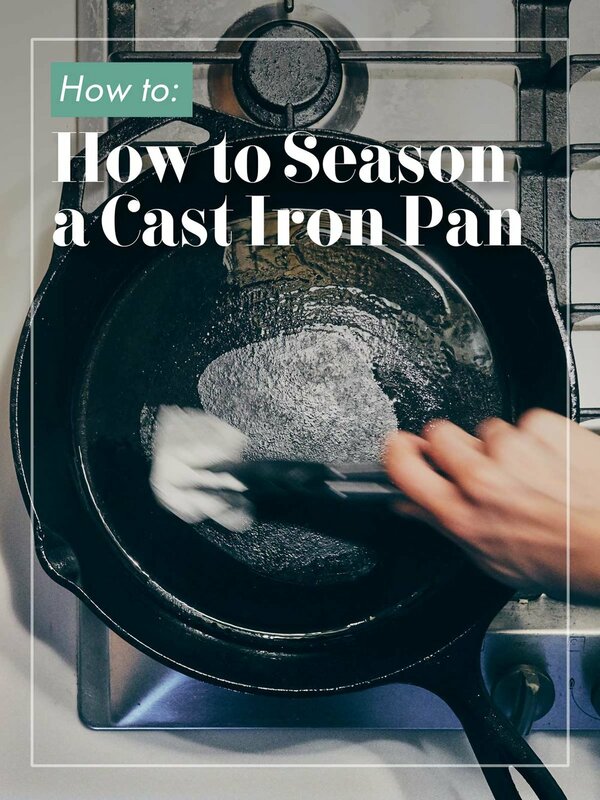 Keep reading to learn more on “How to Take Care of Your Cast Iron Pan”.